P&P wars: which one is better? So many people have different views on this…issue. While some may think that the whole thing is ridiculous and/or stupid, I’d beg their pardon and tell them that this is — *ahem* — a VERY big deal, and it should be talked out and discussed among us die-hard Jane Austen fans. I mean, really, it is a legitimate question: which one is it? 1995 or 2005? Colin Firth or Matthew Macfayden? Jennifer Ehle or Keira Knightly? Old or new? Pride or shy? Prejudice or feminist? And the questions go on! 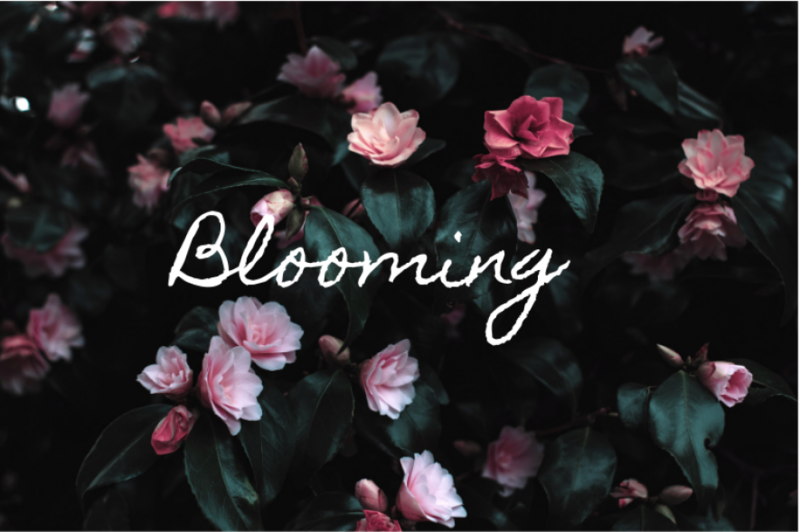 Here, I am going to show you a post from all things bright and beautiful, a blog by Petie, and what she has to say defending P&P 2005. There are many, many reviews out there defending the newest movie, but I think Petie ( and her friend) raise some interesting points, especially concerning the comparison between the two Mr. Darcy’s and the two Elizabeth Bennets. Several months ago, the lovely Eva from Ramblings of a Janeite invited me to co-author a post defending our favorite version of Jane Austen’s beloved Pride and Prejudice (Eva and I are staunch members of the minority of P&P fans who actually prefer P&P 2005 over the esteemed 1995 version.) So, if you don’t mind, indulge us as we rave over our favorite period drama, gush about Matthew MacFadyen, and be the all-around Jane Austenites that we are. 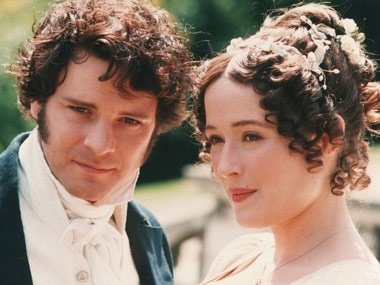 For several years, we have wondered why on earth Jane Austen fans dislike Pride and Prejudice 2005. We’ve both watched the film several times and although we love the Colin Firth version, we both agree that P&P 2005 is a wonderful adaption of P&P and the version we tend to prefer. Why then, do so many true Janeites dislike it? We culled through all the different reasons (though it nigh broke our hearts to do so) and we made a list. We are prepared to refute each point and give the reasons why we disagree. We hope that by the end of this post, you’ll be fully convinced of the superiority of P&P 2005. And if you aren’t, we’d love a good [respectful] comment war! Let the fun and games begin! 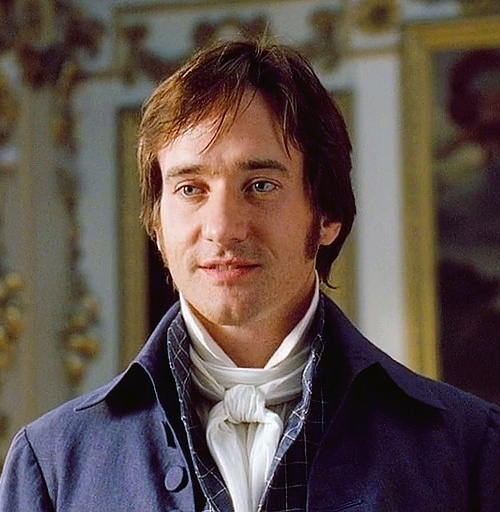 One of the biggest problems P&P fans have with 2005 is Matthew MacFadyen’s portrayal of Darcy, claiming he is too shy instead of proud (well, really their main issue with him is that he’s NOT Colin Firth). We may very well be the biggest MM fans out there, and we think his portrayal of Darcy is a wonderful balance and spot-on representation of everything Darcy is supposed to be. 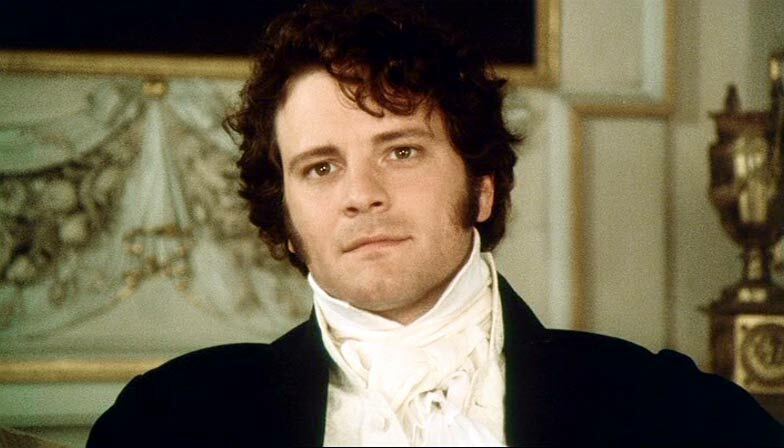 We will be the first to admit that Colin Firth is an amazing Darcy, and he totally nails the pride aspect of the character. But unfortunately, he is too stiff and rigid, saying most of his lines in a flat tone, as if he is simply reciting them instead of becoming the character. This is where Matthew MacFadyen really shines. He brings life and hard-core emotion to the character of Darcy, really making Darcy seem like a real, natural human being. He shows both the prideful and yes, shy sides of Darcy while also displaying the hurt and pain Darcy endures at Elizabeth’s rejection and Wickham’s betrayal. Many die-hard Pride and Prejudice fans believe that Kiera Knightley is too ‘modern’ to play Elizabeth Bennet. We tend to disagree (are you surprised?). For one, there are two other ‘modern’ actresses that pop into our heads and none of you have any problems with these two – Romola Garai and Emily Blunt known respectively as Emma Woodhouse (2009) and Queen Victoria (The Young Victoria). Though we are not here to discuss these talented people, we do have a point to make. These ‘modern’ actresses bring a fresh, new take on the character. Another point is – why would you want another actress to copy Jennifer Ehle’s performance? If Kiera did that, what fun would it be? Personally, we both believe that Kiera Knightley’s fine eyes, slender figure, spirit and wit all come together to produce the epitome of Elizabeth Bennet. If ever there was a book-to-film character it is definitely Elizabeth Bennet to Kiera Knightley. Is 2005 too “muddy” for a period drama? Some people say so, pointing out the dirty sets, the gritty scenery, and the all-around grime of some of the locations. The Bennets’ home, especially, seems very dingy. Surely this dirtiness is not Jane Austen! Well, we can definitely see their point, but we rather enjoy the realistic feel the far-from-perfect sets give the story. The Bennets are indeed somewhat poor, so their home should look drastically different from Bingley’s or Darcy’s, and 2005 draws that distinctive line very well. The dirtiness of the scenery gives more depth and texture to the film, instead of everything looking exactly the same as in 1995. Instead of all the homes being spotless, shiny, and expensive, there are differences and texture to show the various social classes. Is this historically accurate? Who really knows. But we appreciate that element of the movie. One of the biggest (and hardest to defend) points against P&P 2005 is that the Bennet family is portrayed as paupers. This does have some truth in it. One scene shows a pig being led through the house, the family meals are free-for-alls and Mrs Bennet wears outdated clothes. But one of our favorite things about P&P 2005 is that it shows a slice of real life. The 1995 adaption is too perfect – everything is always fresh and clean and beautiful whereas Pride and Prejudice 2005 is gritty and real. The Bennets should have been portrayed more accurately but the thing about it we like is that it shows real life in seventeenth century Britain. Then, of course, there’s the issue of the supposedly inaccurate costumes and hairstyles of 2005. We must agree, it was probably inaccurate for Keira Knightley to trod all over town with her hair down. But we have to wonder… that same hairstyle is in several Regency films we know and love. Is it really so inaccurate? We will admit, however, that the costumes don’t seem very Regency. Though most of them are lovely and varied, they aren’t consistent with traditional Regency fashion. But that doesn’t stop us from admiring the costumes in this film! Jane’s, especially, are some of our favorites, with her bright, but soft colors and lovely bonnets. Many people dislike that several scenes and a couple of characters have been cut from the film. However, there are many, many different feature-length films out there based on books. And most of them probably cut scenes and characters. We believe that in this, P&P 2005 is just like any other feature-length movie. And we firmly claim that it does an excellent job in the time allotted to tell the story – it captures the spirit of the book perfectly! Regarding the other actors in this film, well, you’ve heard it once; you’ve heard it a million times. “Mr. Bennet is dry as powder!” “Wickham is all wrong!” “You’re not supposed to pity Mrs. Bennet!” “What’s with Charlotte?” Yeah, yeah, we hear you. Of course, we always prefer when film adaptations stick as close to the books as possible, but this is a movie. It’s not the book! Therefore, there are going to be some differences. And think about it: if the characters in 2005 had been exactly like the characters in the esteemed 1995 version, wouldn’t that be, well, boring? We do admit that 2005 contains different interpretations of Jane Austen’s beloved characters, but we must confess we enjoy seeing characters portrayed in different lights. But of course, we are still avid Jane fans and infinitely prefer the original characters she created. We are not afraid to admit that the script for P&P 2005 could have used things from the book to its advantage, but like we said earlier, P&P 2005 captures the essence of Pride and Prejudice, the meaning of it. P&P 1995 certainly follows the book more closely but it had five hours to tell the story! What do you expect? Whenever we read Pride and Prejudice the 2005 adaption comes to mind. Which is better – following the book word-for-word or bringing it to life? And now it is time for perhaps the most controversial P&P 2005 topic ever: The Final Proposal and The Ending. We’re not going to take the time to explain all the reasons Jane fans despise the ending of this film. Instead, we’re going to ignore all their protests and say that we simply adore these scenes. Adore in the highest sense of the word. Matthew MacFadyen’s acting in the second proposal is heartmelting. “I love, I love *his voice catches* I love you. And never wish to be parted from you from this day on.” And admit it, folks. The setting of that scene is just breathtaking: the gentle dawn, the soft lighting, the lush green field, the sun coming between Elizabeth and Darcy’s faces. Gah. It is so, so gorgeous. And The Ending of this film. Wow. By the time the credits roll, we are mushy, teary messes, grabbing for Kleenex and hitting the rewind button. To be blunt, we really don’t care what anyone has to say about these two scenes. They are our very favorites and the highlights of the film. So there. Here’s the deal, peoples. We are die-hard fans of Pride and Prejudice 2005 (And everyone recoils in shock! No! Really? ), but if you love the 1995 version better, hey, we can live with that. But with this post, we just wanted to prove the gorgeousness of the 2005 film and how it still maintains the spirit of Jane Austen’s novel. We love the 1995 version as much as anybody, but we just love the 2005 version more. *ducks rotten tomatoes* So we’re not here to bash 1995; we’re just here to prove that each version is different and unique in its own right, and both films should be considered on equal levels. And goodness, we just love this film so much. Everything about P&P 2005 just screams beauty. The scenery, the music, the actors, the costumes, Matthew MacFadyen… dear, oh dear. How did that one get in there? So if you’re totally against P&P 2005, give it another go, yes? And if you’ve never watched it because you were told it was lame… well, there is no excuse for you. Watch. It. Now. Or we will be forced to come after you with our bonnets flying. So…I think they brought up some good points, ones that I’ve never really thought about before. However, I still disagree with them in some areas. Let me start off with: Colin Firth is possibly one of THE BEST Mr. Darcy’s I’ve ever seen. Seriously. He captures Mr. Darcy almost pinpoint. Even though the first P&P that I watched was the 2005 one (*gasp* I know), he still shines brighter (I think) than Matthew Macfayden ever could. MM is very talented, but he is the kind of guy who can play the likeable guy, not the prideful, despicable man who looks at everyone down his nose. Colin Firth mastered that. And Colin also demonstrated Mr. D. when he (finally!) let go of his pride and married Elizabeth Bennet. 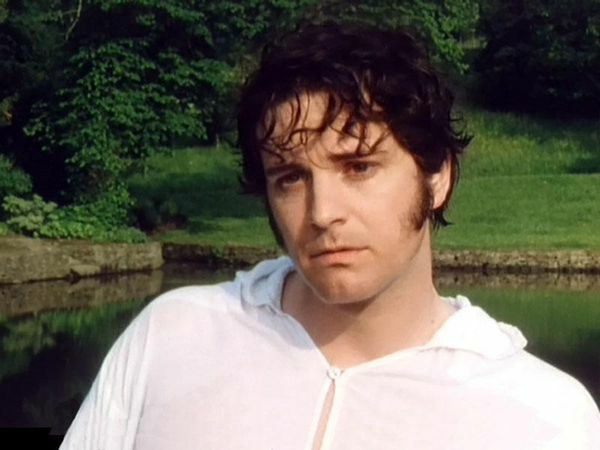 HOWEVER (yes, there is a however…), there was one thing, I have to admit, that Colin Firth added to the character of Mr Darcy that made him less personable. He was a *littlelittleittybittybit*…tight. And stiff. I feel that he wasn’t as real…as he could be. That is my one and only complaint. Let me explain. Although Colin Firth was closer to the book, just like Petie and Eva said, I’d have to say he wasn’t as vulnerable and realistic– and perhaps not as relatable and personable– as Matthew Macfaydon smoothly portrayed the incredible Mr. D. to be. Now onto Matthew Macfaydon. 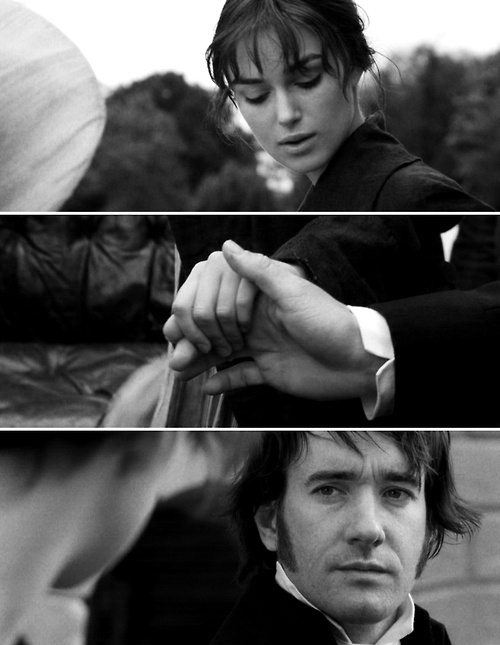 He did a very, very good job capturing the other sensitive, agonized, and that cute touch of shyness- side of Mr. Darcy. Unfortunately, he emphasized on THIS aspect of Mr. Darcy, and very little on his pride, which was an EXTREMELY major part of Darcy’s character! MM showed us that small detail of Mr. D’s very person which I think very few of us notice. But it’s there. He’s shy. He’s prideful, yes, but I think, below ALL of that, he’s really is shy and partly uses his pride to mask and suppress that. And, I really do like how this is portrayed in the movie. I really do. But, honestly, he’s a little *too* open in showing this throughout the movie. It’s something that is supposed to be hidden, but known by the reader. So, yes, he’s captures that cute-shy boy personality, but he shows it a ::wee:: too much throughout the movie. Jennifer Ehle, in my opinion, *totally* nailed Elizabeth Bennet. 🙂 She’s soft and feminine, but yet she also has that playful and witty side of her spring up on occasion. Jennifer was not as young as Keira Knightley was for the part, but she definitely captured everything flawlessly and perfectly portrayed the character whom we girls (almost) always identify with. She wasn’t fake or cheesy, but she seemed to almost, I would say, become Elizabeth Bennet. My one and only complaint would be that, in comparison to Keira Knightely, I almost wish she showed more of her playful disposition, and maybe a little stronger emotion. And this is where Keira comes in. Keira Knightley is a little different version of Elizabeth Bennet. She’s more outgoing, sarcastic, playful, and, I would say, she shows a little more emotion than Jennifer Ehle. In some ways, this is a good thing, in different scenes, but sometimes, I would say, she took the prejudice too far, and in some scenes, she came across almost feminist (not always, but sometimes), as one of my teachers pointed out. And she came across a *little* less quiet and feminine compared to the amazing Jennifer Ehle. You know, I could go on and on about the comparisons of different characters, who’s better, and why, but I won’t, because this post is already too long as it is, :D.
But now you’re probably wondering, which one is my favorite? I would have to say I sincerely like both, but for different reasons. I like the old one, because it sticks closer to the book, and the original story, but yet I like the new one, because it changes things and, in some ways, brings it more to life. But yet I also have to say, that neither of them capture the story pinpoint. Because you know what? There are *always* different interpretations of this story, because the characters are so deep, and no one can be *exactly* like a character in this book, no matter how much they can relate to them or how much they are like them. And that’s what makes Pride and Prejudice unique. These characters, are like real people, real souls … and real people cannot be perfectly replicated.